Will lower gas prices drive down demand for hybrids? Hybridfest president Eric Powers says hybrid vehicle advocates have been discussing what impact the drop in gas prices might have on future developments. “I think there is a chance we could fall into that complacency again,” says Powers, when asked whether he sees any parallel between the present moment and the shift to gas guzzling SUVs after the energy shortage of the 1970s. But higher prices remain in peoples minds, says Powers. With dealers offering enormous incentives to clear their lots of conventional vehicles, Powers believes the case for hybrids remains strong. “Look at the long term, and make the assumption that gas prices are not going to go down drastically,” he says, noting that he bought a hybrid when gas was at $1.57 a gallon. Powers does worry that the tightening financial markets make it tougher to invest in new technologies. “I do see that as a concern,” he says. “Money is becoming tight for those who would normally be able to invest in these kinds of things.” But he remains enthusiastic about the future. 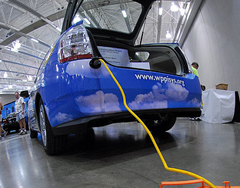 “I&apos;m really excited about the plug in hybrids,” says Powers. “I think that&apos;s going to usher in a new wave of people getting into hybrid and electric cars.” Powers, who bought his first hybrid in 2003, says we&apos;re still just “one disaster away” from another spike in gas prices. The third annual Hybridfest was this past July in Madison.